Shred Bull goes to great lengths to ensure your documents are destroyed and secured. Shred Bull does background checks and performs random drug tests on all employees that handle client documents. Our Mobile Shredding Truck shreds ALL documents at your site(FYI: Not all shredding services shred at your location). Shred bull trucks use 3 ton Hammermill shredders that pulverize the material by hammering it through screens rendering the documents into random torn pieces of material that is virtually impossible to reconstruct. Our truck also has windows so that you can watch as your secure documents are rapidly torn up and destroyed. We encourage you to watch us shred for you! 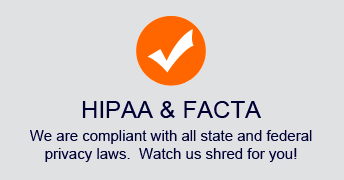 In California shredding customer records isn’t just a good idea, It’s the Law! 1798.81. A business shall take all reasonable steps to dispose, or arrange for the disposal,of customer records within its custody or control containing personal information when the records are no longer to be retained by the business by (a) shredding,(b) erasing, or (c) otherwise modifying the personal information in those records to make it unreadable or undecipherable through any means. We all need protection from rampant identity theft and from criminals looking to exploit weak privacy practices. Here are some links and information about laws and legislation will help you ensure that you are compliant. Health Insurance Portability and Accountability Act (HIPAA) of 1996 regulates the healthcare industry in the US and assures that healthcare organizations are responsible for the secure electronic transmission, secure storage and disposal of patient information. Gramm-Leach-Bliley Act of 1999 (GLB)requires financial institutions to develop precautions to ensure the security and confidentiality of customer information, and to protect against unauthorized access to or use of such records. This includes secure storage, disposal, and sharing of confidential information. Fair and Accurate Credit Transactions Act of 2003 (FACTA)amends the Fair Credit Reporting Act. FACTA is intended to combat consumer fraud and related crimes, including identity theft, and to assist its victims. Specifically the act requires the destruction of papers containing consumer information. reasonable steps to destroy a customer’s records that contain personal information when the business will no longer retain those records. At Shred Bull we recycle because we want to make sure that our practices preserve the environment. We service accounts in the field Monday-Friday 7:00AM- 7:00PM and are open by appointment on Saturday AM. 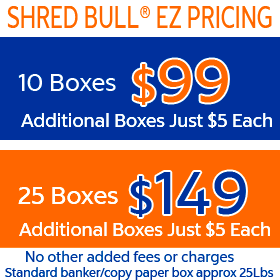 We can accommodate some special shredding requests on most weekends.